The museum technical community got some good news today: MuseTechCentral officially launched. Billing itself as the MCN Project Registry, the site seeks to “provide a place for the MCN community to share information about technology-related museum projects”. When starting a new project, it’s smart to see if this problem has been solved before. If so, how? And for how much? Is it worth the investment? Or is there a vendor to avoid? Now you can find out. Vice versa, upon completing a project, you may find yourself being hit up constantly for information requests. 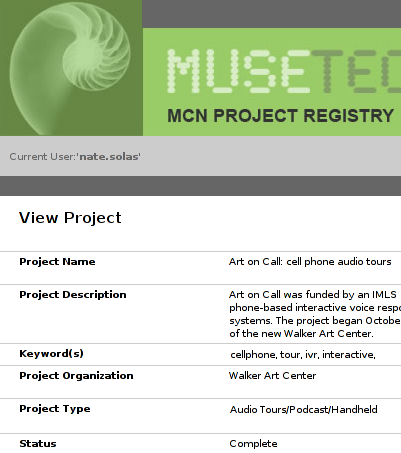 Now you can now simply refer people to your project page on MuseTechCentral. While I was there I created an account and added our Art on Call project to the registry. The site is full of ajaxy goodness that makes form entry and navigation a breeze, although I do wish you could bookmark filtered results. So far the projects seems to be fairly art-museum-centric, but hopefully that will change as more institutions start to contribute. The registry will be most useful if it truly represents the museum community, so if you’ve got a project to add… go add it! Overall, this is a great effort by the Museum Computer Network and the Museum Software Foundation. Looking forward to future browsing and adding many more projects!